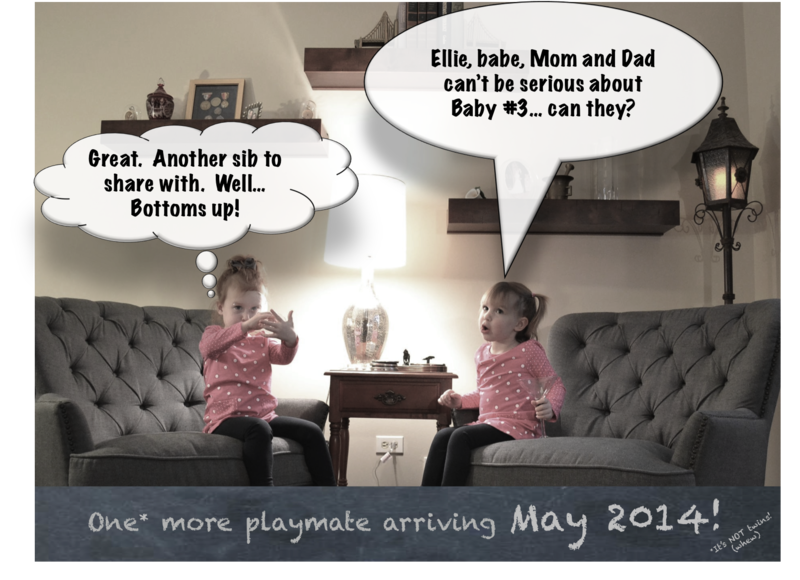 three | emmy kay and co.
We are pleased to announce that we are expecting our third baby in May 2014! Having children is certainly an… adventure… for us and for a long time, we weren’t sure if we’d have any children, let alone fulfill our hopes for a larger family. We can scarcely believe that we’ve been so blessed with the twins and to find out that we are expecting a third is beyond amazing. Since my husband is Frank the Fifth, we’ve been asked plenty of times whether we are hoping for a boy next. We’ve talked about our hopes and desires for the next baby, and as cliche as it sounds, we would just be beyond grateful for a healthy baby. We figure a girl is great because we have all the clothing, toys and so on that a girl could ever need. And also – we know how girls work. The dolls, the moods, the sensitivity, the giggles – and we love everything about having twin girls – so one more girl would be delightful! We figure a boy is great because, well, we don’t have a boy and boys seem like fun! Wrestling on the family room floor, trucks (which the girls love, too) and other dude stuff seems like a good time for everyone. Plus, it helps Frank have someone he can relate to on a manly-man level. You know, passing the torch and what-not. So far, I’ve had six ultrasounds, thanks to a pesky bleed and other factors, and the baby is growing right on target and is a super swimmer – jumping and kicking all over the place. This one reminds me of Carrigan. Carrigan was always jetting around her amniotic sack, giving her sister a run for her money. We haven’t decided officially if we want to know the gender ahead of time. There are few great surprises in life – the gender of your children being one of them.